A brief GRAMMAR-GUIDE and two exercises to practise THIS,THAT, THESE,THOSE. I hope it´s helpful. WHAT ARE THESE PEOPLE GOING TO DO? -5 Activities to practice the "GOING TO" FUTURE, Affirmative, Negative and Interrogative Sentences (Yes/No Questions and Wh/Questions).I hope your students enjoy it. 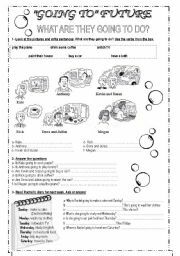 A worksheet to practise the verb HAVE GOT in AFFIRMATIVE, NEGATIVE and INTERROGATIVE forms. And the TOYS, too. I hope it´s useful. 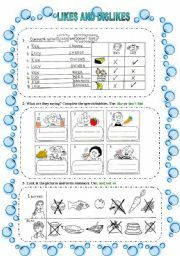 "Thanks a lot for your nice comments on my worksheets"
A worksheet to practice the SIMPLE PRESENT of the verb "LIKE" in all forms: AFFIRMATIVE, NEGATIVE AND INTERROGATIVE with FOOD(Healthy/ Unhealthy Food)and DRINKS. 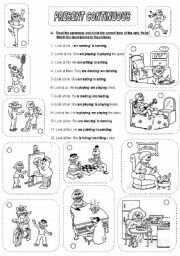 "I hope you LIKE it"
A worksheet to practice the SIMPLE PRESENT form of the verb LIKE;(1st person singular and 3rd person singular); DOESN´T; FOOD AND DRINKS. I hope you enjoy it. 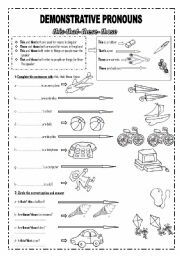 This is part 1 of two worksheets. In part 1, students will practice the PRESENT CONTINUOUS(Affirmative Sentences), OBJECT PRONOUNS and ACTIONS. I hope you enjoy them. 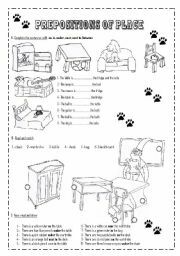 This worksheet deals with PREPOSITIONS OF PLACE and also with colours, schoolobjects and furniture. I hope you like it and find it useful. 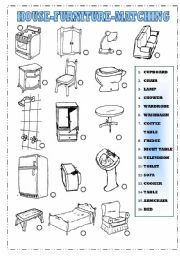 Students have to look at the pictures of furniture and match with the words. 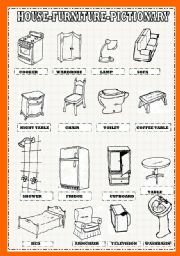 A furniture pictionary to work with the parts of the house. I hope it´s useful. 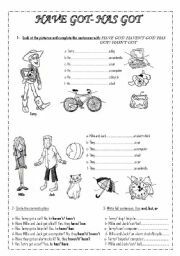 This worksheet has 2 pages to practise the PAST SIMPLE of the verb TO BE, in all forms AFFIRMATIVE,NEGATIVE AND INTERROGATIVE. 9 different exercises (complete a dialogue, look at a file and write a text, circle the correct option, order the words to form sentences, etc. )I hope it´s useful.